Okarche Educational Foundation, Inc. was formed as a non-profit organization for scientific, educational and charitable purposes. Our main way of supporting education is through teacher grants. Thus far in the past 10 years we have approved over $161,000 in grants that went directly to the teachers. In addition, we sponsor the "Teacher of the Year" award. If you want to make a donation that goes directly to the kids, the Okarche Educational Foundation is one of the purest ways to accomplish your goal. 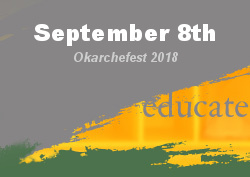 For more information, please email us at okarchefest@pldi.net. The Okarche Educational Foundation is a nonprofit 501(c)3.